One of my favorite fruits is Pomegranate. They are delicious and so healthy for you. One of my biggest problems however, was eating the pomegranate. I would eat it and afterward look like a slasher movie. -Cut off the crown (you’ll see it) and throw it away or better yet use it for compost. -Score and slice the rind all around, but don’t cut the rind all the way through. -Soak the pomegranate face down in cold water for about ten minutes. -While the pomegranate is still in the bowl of water, break apart the scored rinds, and remove the seeds from the flesh (the seeds will sink to the bottom of your bowl). -Remove the rind and membrane from the bowl with a sieve or spoon. The benefits of Pomegranate are numerous including: Lower Risk of Heart Disease; Lower Risk of Cancer (Especially Prostate and Breast); Lessen Symptoms of Diarrhea; Reduce Cholesterol; Control Your Weight; Fight Cell Damage. 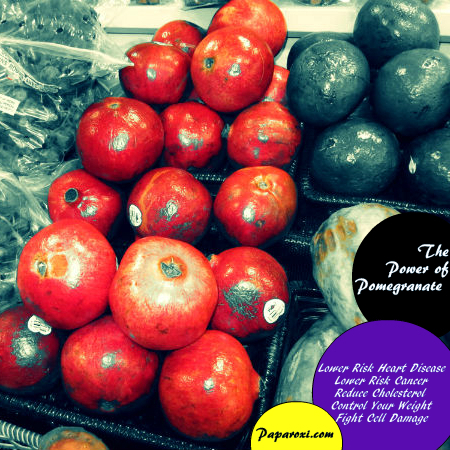 So pick up some pomegranate today!